The NVIDIA GeForce GTX 1050 Ti has proven itself to be a winner at the $139 price point when we took an in-depth look at the MSI GeForce GTX 1050 Ti 4G OC during last months launch. Getting the best gaming GPU for the money is important as it is arguably the most important component of any gaming PC. The nice thing about budget graphics cards like the Geforce GTX 1050 Ti is that you can usually get away with the minimum power supply of just 300 Watts and since no extra power connectors are needed you can pop one of these bad boys in many OEM systems without issue. This means you can take an older system that might have been running crappy integrated graphics and give your system one heck of a performance increase and get native DirectX 12 functionality thanks to the latest GPU architecture being used in the Pascal powered card. Once you narrow your search down to a specific series you can then start taking a closer look at what cards have higher clock speeds, more overclocking potential, better custom cooling solutions and so on. The problem is that there are a ton of custom card manufacturers with GeForce GTX 1050 Ti graphics cards on the market; ASUS, EVGA, MSI, Gigabyte, Zotac, and PNY are just some of the companies producing these Pascal based cards. 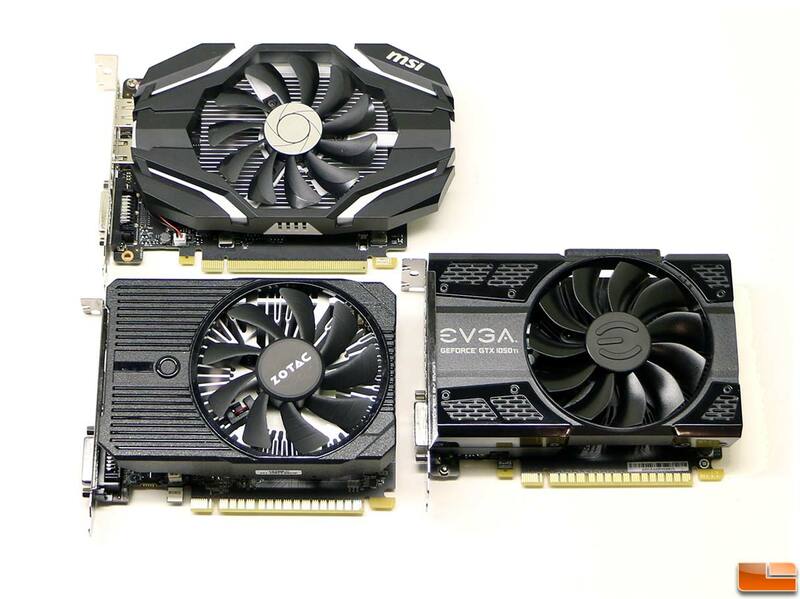 We’ve gathered up three partner cards for a little GeForce GTX 1050 Ti roundup for you to help see the differences between some of the cards on the same system. Meet the MSI GeForce GTX 1050 Ti 4G OC, Zotac GeForce GTX 1050 Ti 4GB Mini and the EVGA GeForce GTX 1050 Ti 4GB SuperClocked! 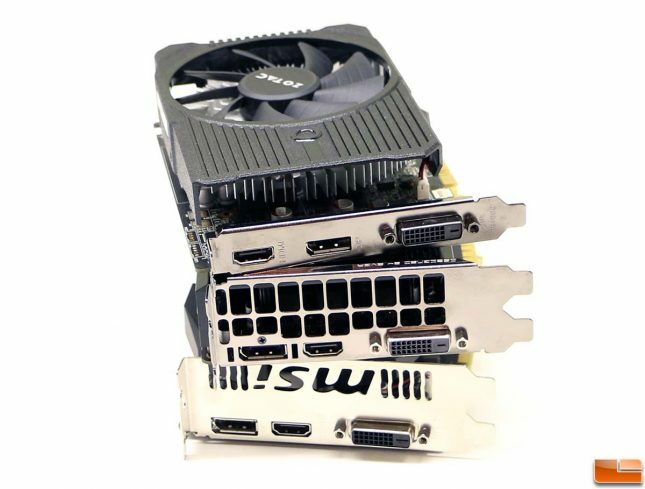 These are three examples of GeForce GTX 1050 Ti cards that are priced in the $139 to $149 price range and all feature custom PCB designs along with custom coolers that each have one 90mm fan. The MSI GeForce GTX 1050 Ti 4G OC is the longest in the group at 177 mm since the plastic fan shroud hangs over the end of the card. The EVGA and Zotac cards are both 144.8 mm long. 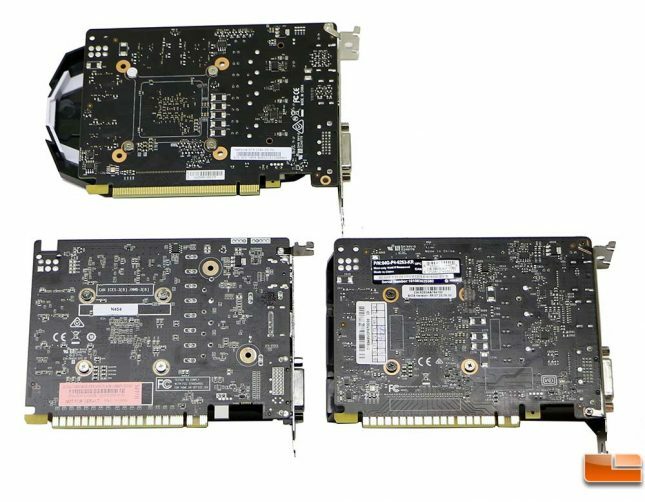 Despite all three PCB’s having a location for a 6-pin PCIe power connector, none of the cards have the plug as bus power is more than enough for these cards. All three of these cards feature a 3+1 power phase design and have a maximum power draw of 75 Watts. The good news is this card should use less than 71 Watts of power unless you overclock it and then it will be limited to just under 74.8 Watts due to the way the hardware and software was designed. When it comes to video card connectors each of the cards have one DisplayPort (Version 1.4), HDMI (Version 2.0b) and Dual-Link DVI-D video connectors. The GeForce GTX 1050 Ti supports up to 3 monitors at a maximum refresh rate of 240Hz and a maximum digital display resolution of 7680 x 4320 (8K UHD). All are dual-slot cards, but note that the Zotac card features just a single slot bracket with no hot air exhaust ports. This means the Zotac GeForce GTX 1050 Ti Mini will keep all the hot air from the GPU in your case. The MSI GeForce GTX 1050 Ti 4G OC has some ventilation holes and then there is the EVGA GeForce GTX 1050 Ti SC that has the most exhaust ventilation and a fan shroud that actually extends to the I/O bracket. These cards are pretty similar in the appearance department, so let’s take a closer look at the specifications for them in the table below. When it comes to pricing you have the Zotac GeForce GTX 1050 Ti Mini and the MSI GeForce GTX 1050 Ti 4G OC both coming in at $139.99 before any rebates or specials. Between those two the MSI GeForce GTX 1050 Ti 4G OC has higher core clock speeds, but is also over 30mm longer in length. The EVGA GeForce GTX 1050 Ti 4GB Superclocked video card has the highest clock speeds of the group, but you’ll pay an extra $10 to get those higher clock speeds. The EVGA GeForce GTX 1050 Ti Superclocked is only clocked 13 MHz higher on the GPU base/boost clock, so there isn’t much of a difference there to be had. Let’s take a look at the test system and some actual performance numbers!